All of our hand carved details are designed and created in our factory, and we can customize your console with any hand carved design that you would like. 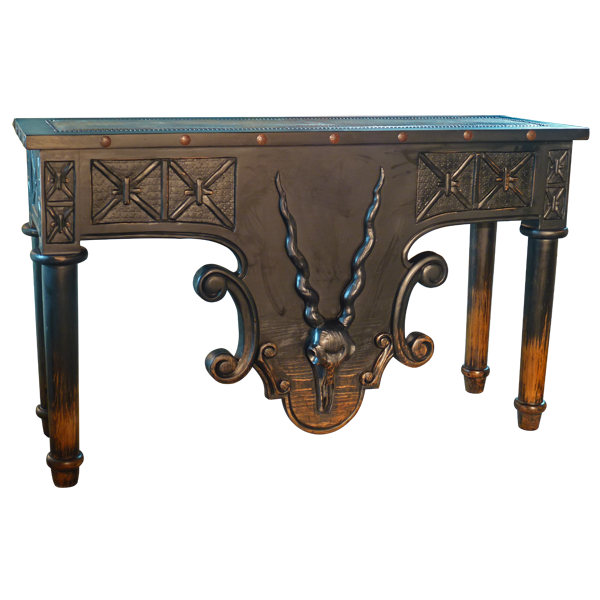 The front of this console has a large apron, and the apron is adorned with a magnificent, hand carved gazelle head with horns. Each side of the front apron also has a graceful, hand carved, scroll design. The front of the console is additionally embellished with hand carved, geometric designs that continue to the lateral sides of the console. The open, wide top of the console is adorned with an inner rectangular design that is covered with rich, brown, full grain leather. The rectangular, leather design is contrasted by the beautifully, finished wood that borders the leather. The sides of the top rim are adorned with intermittently hand tacked, hand forged, iron nails. 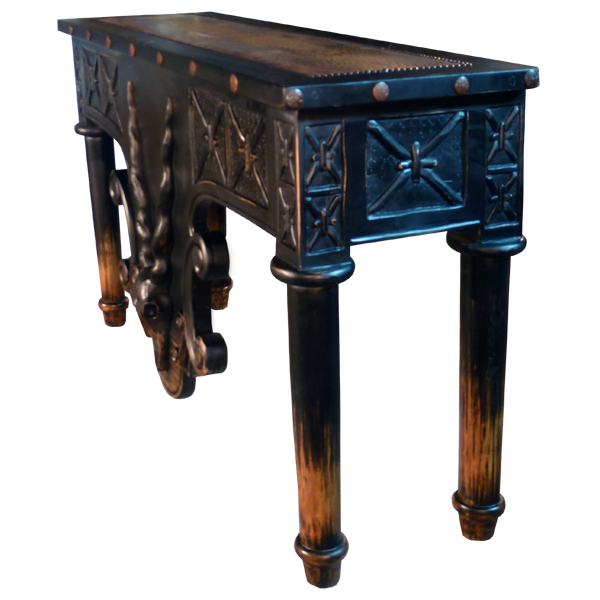 The leather is hand tacked to the solid wood frame of the console with ornate, gilt nails, and the leather is double stitched for extra strength and durability. The console is supported by beautiful, hand turned legs that taper at their ends. It has an antique, dark finish, and the console is made with the best, sustainable, solid wood available. It is 100% customizable.